Welcome to the September Stamp of the Month Hop! 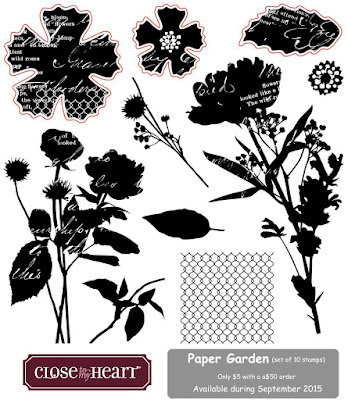 This month we have a beautiful stamp set called Paper Garden. Now, if you've arrived from Gina Brandstetter's blog you're on the right track. This is a big circle and all you have to do is click the link at the end of the post to continue with the hop! I just couldn't wait to work with this stamp set! If you looked through my stamp drawer you'd find I'm very partial to flowers! I stamped the large image in 2nd generation ink to create a background. But I did something a little different while inking the stamp. I tapped it on the ink pad to make sure the image was completely inked. Then I pulled it across the pad to streak the ink and stamped it on the cardstock. The streaking gives a nice texture to the image. After that I stamped a smaller image in 1st and 2nd generation ink to create depth. The background layers are from the Paper Fundamentals packs. One side of each sheet has a glossy tone on tone pattern. The pattern on the opposite side is the same but has white with the color of the sheet. Here is the same design with different colors! What a difference changing the colors can make! I'd love to be your consultant! Now it's time for more inspiration! 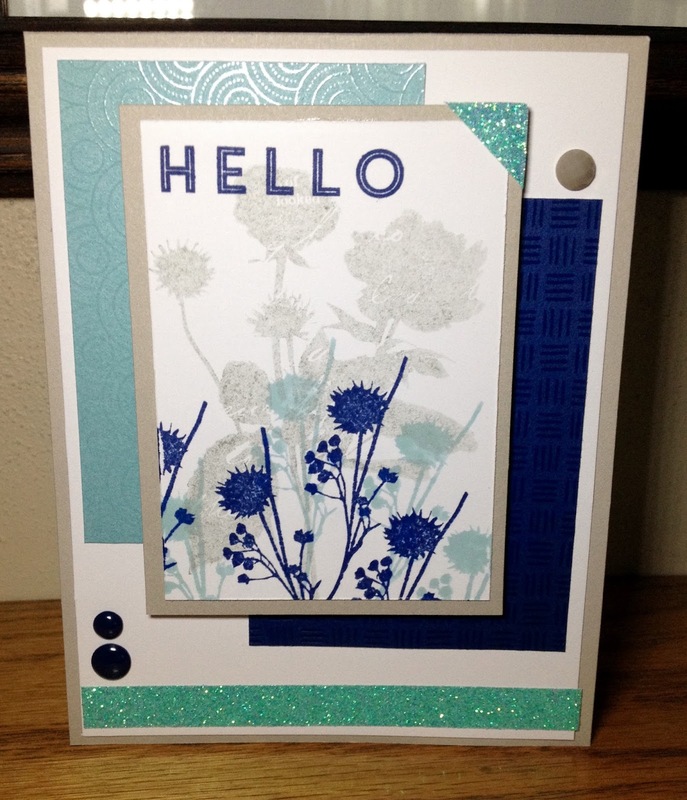 Hop over to see what Chris Robertson has created on her blog. Great cards! My favorite is the Sapphire Card, love this color! Thank you. That's my favorite, too! Very pretty. Love the layering of color. Thanks, Lee. I love our shimmer trim! Just beautiful and great idea to showcase two colour schemes. Love it! Thanks, Jennifer. Isn't it amazing how much a color change does! What a cool effect. Love the shadowed look of the larger flowers and the pop of the colored flowers. Thanks, Catherine. I love how it creates depth. These are both gorgeous, but the blue is amazing!!! Thank you, Jacquelin. The blue is my favorite one. Love how different the cards are just by changing the colour pallet. Oh, I think I like the blue card the best. I love the swiping stamping method, it gives a different look to the image and I love the little shimmer trim corner. Fantastic cards. I really love the swiping and 2nd generation stamping. It really creates a lot of depth. Both cards are beautiful! 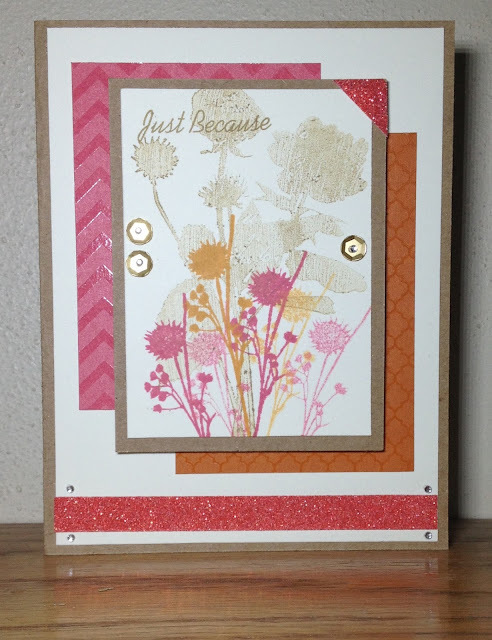 You did a wonderful job displaying the beauty in this stamp! Nice stamping of the flowers - really like the shadows in the background, with color added in the foreground.